Marking the midpoint of the World Council of Churches' Decade to Overcome Violence (DOV), participants at the 9th Assembly wondered if churches were abandoning people in Northern Uganda and if church leaders were engaging in "sterile" debates about when violence is permissible. One joke making the rounds was that last month's World Council of Churches assembly in Porto Alegre, Brazil, may have contributed to global warming. This February, three Luther students and a faculty supervisor traveled to Porto Alegre, Brazil to attend the ninth assembly of the World Council of Churches (WCC), an international conference attended by delegates from 348 Christian churches located in over 120 countries. Keeping an eye on ecumenical developments as well as using an opportunity to build bridges of understanding, representatives of the Seventh-day Adventist world church were observers at the 9th Assembly of the World Council of Churches (WCC) in Porto Alegre, Brazil from Feb. 14 to 23. Drs. John Graz, Eugene Hsu and Bill Knott attended as Adventist observers. 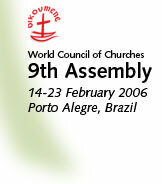 After the US Conference to the World Council of Churches presented its letter to the 9th Assembly of the WCC in Porto Alegre, Brazil, in February, the Very Reverend Leonid Kishkovsky, the US Conference moderator, commented that it would cause "anguish" and "division" among church members at home. And well it should. A series of ecumenical conversations has been organized at the 9th Assembly of the World Council of Churches at Porto Alegre, Brazil, to provide a space for delegates to share their experiences in addressing key concerns for the future of the churches and their common witness and action. "A united church is no optional extra," said Archbishop Desmond Tutu in an impassioned speech to the World Council of Churches 9th Assembly in Porto Alegre. Rather, he said, it is "indispensable for the salvation of God's world". NEW YORK (UMNS) - The World Council of Churches has been accused of merely giving lip service to youth after falling short of its goal to fill 25 percent of the seats on its central committee with young adults. From Feb. 14-23, the campus of Catholic Pontifical University was transformed into a global village for the World Council of Churches 9th Assembly. A river of light flowed through downtown Porto Alegre last night as up to two thousand people - including two Nobel Prize-winners - took part in a candle-lit march for peace.